Audience: 5-7 years, though some children may be frightened by the first illustration of what appears to be an aggressive dog. Summary: A neglected dog, whom no one understands, ends up alone in a pound, yearning for a home. A kind shepherd eventually adopts the dog and helps him become what he was meant to be. Literary elements at work in the story: The author and artist work in flawless tandem as they develop the character of the nameless dog in this story. The first double-page spread shows the dog as others see him: “pointed ears, sharp teeth … Just like a wolf.” The stark black and white silhouette of a fierce dog behind a chain link fence sets an expectation for meanness and ferocity to come. By the second page, however, author and artist switch gears and engage the reader’s sympathy for the poor beast chained on a concrete pad. Spare text in the first person moves the dog from a neglectful home to incarceration at the pound and then to adoption by a loving master. The reader experiences the visceral reality of abandonment and rejection evoked by pictures of the dog with ears back and eyes closed and then the poignant joy of belonging with the pictures of the gentle touch on the head and the first tentative step away from the cage. How does the perspective on gender/race/culture/economics/ability make a difference to the story? These perspectives do not affect the story. 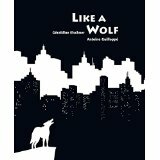 Theological Conversation Partners: Like a Wolf is rich with echoes of scripture. It could be useful in any discussion of who we are and whose we are. We are fearfully and wonderfully made, said the psalmist (139:14); we have been given unique gifts by the Spirt, according to Paul (1 Corinthians 12: 4-14); and the Letter to the Ephesians tells us that “we are [God’s] workmanship, created in Christ Jesus for good works, which God prepared beforehand, that we should walk in them.” (2:10) The lonely dog in the story knows that he was made to run and jump in fields and to be treated kindly. He wants to be who he was made to be, but everyone around him persecutes him for not fitting into their notions of cute and good. Persecution for loyalty to God is a major theme in both Old and New Testament texts (see Psalm 19:157 or 2 Timothy 3:12 for examples), and this book might be used to start a conversation about why people might torment others. The theme of calling in scripture also finds parallels in Like a Wolf. Just as God tells Samuel to ignore David’s small stature, “for the LORD does not see as mortals see; they look on the outward appearance, but the LORD looks on the heart” (1 Samuel 16:7), the shepherd sees what others do not – “a real shepherd dog!” God sees us and chooses us when others do not, and we are completely fulfilled when we do what we are meant to do. And we, like the dog in the book, are happiest when we are beside our shepherd. What was your first impression of the dog in this story? How did you feel about the dog by the end of the story? How did your first impression change? Why do you think that the dog howled and cried? Why do you think that the shepherd decided to choose the dog to take home? What did the shepherd understand about the dog that no one else did? This review was written by Union Presbyterian Seminary alumna and regular reviewer Beth Lyon-Suhring. Beth is the Director of Christian Education at the St. Andrew Presbyterian Church in Suffolk, VA.
Like a Wolf by Storypath is licensed under a Creative Commons Attribution-NonCommercial 4.0 International License.